Visit both Riga and Vilnius: UNESCO World Heritage sites and European Cities of Culture. Riga, capital of Latvia, underwent a renaissance after gaining independence from Soviet Occupation in 1991. The medieval Old Town has been preserved and fully restored after forty years of neglect. 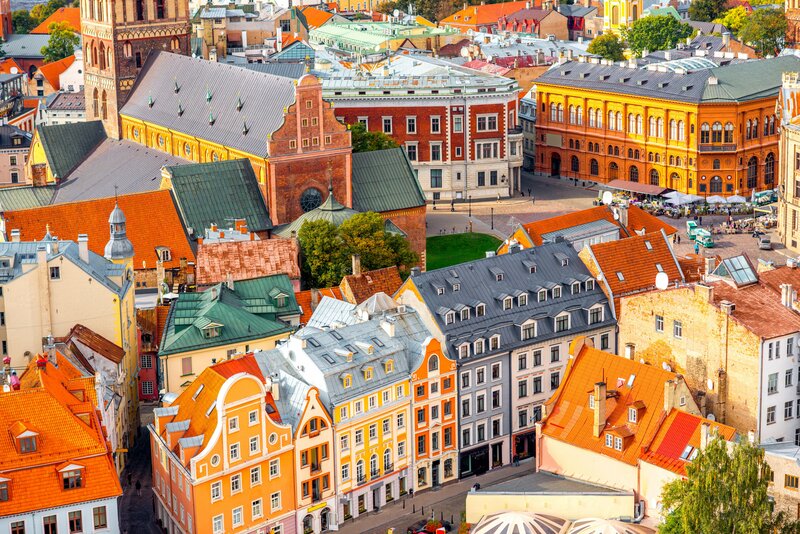 Riga immediately charms – picturesque cobbled streets lined with vividly painted houses spanning six centuries, contrast with flamboyantly decorated 19th and early 20th-century Art Nouveau buildings. Travel out of the city to the 18th-century Palace of Rundale now, after renovation, the finest palace in the Baltic States. Travel on to Vilnius, capital of Lithuania, known for its refreshing old-world charm and fortunate to escape much war damage during World War II so that its uniquely rich architectural heritage remains largely intact and extremely beautiful. Vilnius Old Town is one of the largest and best-preserved in Europe, a mixture of various architectural styles, gothic, renaissance and baroque. Tania Illingworth (nee Tolstoy) is three quarters Russian by birth, all her grandparents having fled the Russian Revolution in 1918. A degree in Russian Language & Literature, with Byzantine Art, reinforced her passionate interest in all things Russian. This, and the extensive knowledge she has acquired through years of visits to Russia, make her tours very special. This long week-end continues to be our most successful repeated short haul destination. Suggested flights (not included in the cost of the tour), British Airways BA 2240 departing London Gatwick at 09.25 hrs arriving Riga at 14.05 hrs. On arrival meet your guide and transfer to the centrally located 5* Grand Hotel Kempinski where two nights are spent. This hotel is situated in the heart of the capital, opposite the National Opera House and the entrance to the town’s historic centre. Enjoy a late afternoon walking tour of Riga including the Old Town, the Cathedral (Dom of Riga) and St Jacobs’ Church. Riga remains the most beautiful of the Baltic cities with a dizzy skyline of gothic church spires and medieval towers. Dinner at a local restaurant in the old town. After breakfast, continue to enjoy the sights of Riga. Drive to visit the largest covered food market in Europe dating from 1922. It is one of the most notable 20thc impressive structures in Latvia and has been included in the UNESCO World Heritage Site list together with Old Riga in 1998. Riga is noted for its rich heritage of Art Nouveau buildings and Jugendstil architecture, entirely due to Latvia’s financial boom enjoyed in the late 19thc/early 20thc. Continue to visit the Art Nouveau Building designed by the architect, Michael Eisenstein – Father of the film director, Sergey Eisenstein famed for his films: Alexander Nevsky, Ivan the Terrible and The Battleship Potemkin. Lunch at a local restaurant. Visit the moving and extremely interesting Museum of Occupation, unique in the Baltic countries commemorating the period of Latvia’s painful history under Soviet Occupation 1940 – 1991. Free afternoon exploring the old town. Dinner under own arrangements. Optional opera or ballet performance at Riga Opera House) (subject to performance schedule). Depart (with luggage) and drive south to the 18thc. Rundale Palace (arch. F. Rastrelli) built by the Russian Tsarina Anna for her favourite Count Biron. The interiors of the palace (restoration in the 1990s largely funded by the Headley Sainsbury Family Trust) are richly furnished and embellished with paintings, furniture, sculptures, chandeliers and works of art. Also see the impressive formal french gardens with ornamental parterres. Lunch in the palace’s restaurant. Afternoon drive to Vilnius and check into the 5* Grand Hotel Kempinski where two nights are spent. The hotel is located in the very heart of Vilnius Old Town, next to the Presidential Palace and numerous historical landmarks. Dinner at a local restaurant. Walking tour of Vilnius Old Town seeing all the highlights of the capital of Lithuania which was European Capital of Culture in 2009. Mostly undamaged during World War II the city is a feast of architecture and unique in Europe. Enjoy the fusion of eastern European and western architecture, a charming medley of medieval, gothic and the baroque, all set along picturesque cobbled streets. See Roman Catholic, Lutheran and Orthodox churches testifying to many cultures, nationalities and religions since 14th century. Also see the fine University buildings dating from 1579 and the Palace of the Grand Duke of Lithuania. Lunch at a local restaurant in the Old Town. Afternoon at leisure. Dinner under own arrangements. Optional opera or ballet performance at Vilnius Opera House (built 1974) (subject to performance schedule). After breakfast, transfer to Vilnius airport. Suggested flights (not included in the cost of the tour) British Airways flight BA6062 departing Vilnius at 09.55 hrs arriving Helsinki at 11.40 hrs. Departing Helsinki at 14.05 hrs on BA 799, arriving in London Heathrow at 15.25 hrs.